Home » attraction » Central Java » This is Why You Should Visit Semarang Once in A Lifetime for Goodness Sake! Welcome to Semarang! If you ever come to Jakarta or Surabaya, next place that you can visit is Semarang. It is famous with many traditional food and many tourism spot. These are why you should visit Surabaya once in a lifetime. Semawis is a culinary market stall night in Semarang, located on Gang Warung. In this 200-meter long road, there are 120 tents that offer you snacks and drinks, from traditional to international. There are halal food and non-halal food as well. Semawis night culinary market is held every Friday – Sunday, 6 p.m – 12 p.m. During the market was held, vehicles are prohibited from entering or parking. Semawis culinary market is never empty. 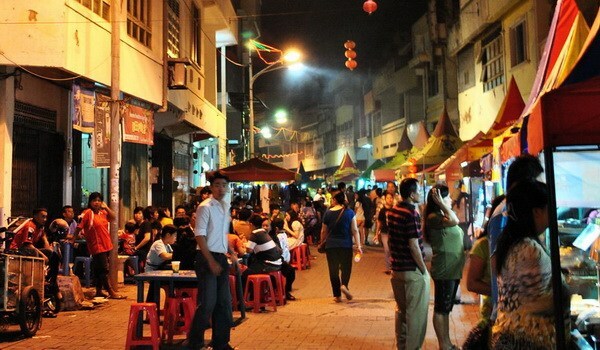 The bustling often occurs on Sunday night. Visitors who come not only local people, but also tourists from outside Semarang. Gang with width about 6 meters is filled with visitors queuing up to try the culinary. If you don’t like with queuing and you want to enjoy culinary, you can come on Saturday night. Because on Saturday night, the number visitors is relatively less or you can come in the early hours, which is about 6 p.m.
What kind of food that Semawis Market offers? Semawis night culinary market provides various heavy meal for you who came to dinner. The choice is very diverse. There are nasi ayam, nasi gudeg, nasi pecel, nasi gandul pati, nasi goreng babat, babat gongso, soto sapi, sate sapi, bakmie Jawa, and many more. For those who want to try to the cake, there are churros that is from Spain, Zupa soup, gelato ice cream, hotteok, and much more. One popular drink in the Semawis market is es puter at Cong Lik ice stand. This ice can say legendary because it has been around since 1944. Es puter made by twisted around. Its main ingredient coconut inserted into the metal tube, and then soaked in a large bucket of ice cubes. The tube is then rotated in circles at high speed until the coconut milk in it freezes. In Semawis market, there are a lot of processed pork. There satay pork, pork sausage, rice dumplings that is inside is pork, pork dimsum, and others. The best sell food is Cik Lian pork satay. This satay is served with additional slices of onion. A plate of pork satay is sold for Rp 35.000 – Rp 55.000,-. Open Hours: Friday-Saturday 6 p.m. – 12 p.m.
Lawang Sewu is a historic old building from the Netherlands. 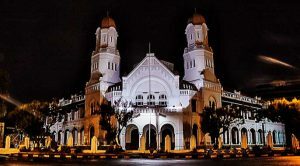 The building that was once used as the company’s central train by the Dutch government, it has now become one of the favorite tourist attractions in Semarang. There are many things you can do there anyway. Either alone or with friends or family. First, you can admire the old Dutch architecture in Lawang Sewu Semarang. This activity is particularly suitable for you history lovers. In this place, there is a cool spot that you cannot missed. There is stained glass hangings in the wall which were under the dome of the main building. This stained glass ornament has height over 2 meters and divided into four large panels. Not only beautiful, the architecture was also designed with full consideration. Besides having a lot of doors for air circulation, also made its chambers are connected for security reasons. Not many people know that there are railway museum in Lawang Sewu Semarang. In this place, there is a wide variety of artifacts, photographs, old-fashioned train tickets, duplicate locomotive, diorama, and the explanation of the history of railways in Indonesia. If you are still hard to imagine aka “Ngawang” while reading a brief history of Lawang Sewu above, in this place you will be much easier to learn the history. Because you can see in the pictures and short movies.. In addition, there are other collections such as typewriters and calculating machines. There is also a library that contain books about trains for you who need in-depth information. Furthermore, there are activities that definitely favored by young people, ie selfie. There are various photo spot interesting in Lawang Sewu Semarang suitable for background selfie. Open Hours: Everyday 7 a.m. – 9 p.m. These are the reasons why you should visit Semarang. So, don’t forget to come to Semarang.